Explore cool games in good company, with tea. 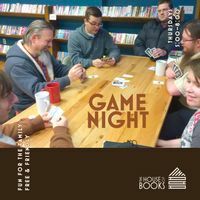 Every Thursday night is game night at This House of Books! Pop by with your friends, your sweetie, or by yourself and enjoy the company of gamers the city over. On Thursday nights, you can find a crowd that understands your passion for gaming. We have a large stock of house games to play, but of course, you can bring your own, or purchase new ones to play that night. We begin gathering a little after 5 and many of us are still playing until 8.